Three bundles deals, very convenient and cheaper for you to buy these straight bundles together. Each Brazilian straight hair bundle is measured to be in true length, weighs about 100g, so three bundles are 300g. The longer bundles you choose, the more bundles you will need for a full head. We also suggest you buy a lace closure or frontal for a better full appearance. Each bundle is cut from single donor, the hair is never processed or chemically treated, hair cuticles are kept intact. Our factory has a series of strict testing method to ensure each hair bundle out of the factory could fulfill the needs of our clients. 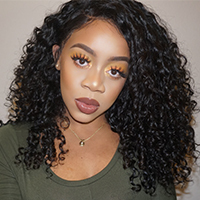 Besides, we have complete return and refund policy, if you have any questions about our hair, we will give you the most professional hair solution.